“I beg leave to propose a short, clear and strong argument to prove the divine inspiration of the Holy Scriptures. The Bible must be the invention either of good men or angels, bad men or devils, or of God. It could not be the invention of good men or angels; for they neither would nor could make a book, and tell lies all the time they were writing it, saying, ‘Thus saith the Lord,’ when it was their own invention. In this case righteousness and holiness are nearly synonymous. If a Christians’ goal is to reflect or radiate the light of Christ in all things, then our actions must be grounded in the Scriptures. As you consider what goals you would like to accomplish or more importantly, how you will choose to set those goals, please consider Prayer, Scripture and Service as foundational in determining how you will spend your time in the year ahead. I’d be remised if I didn’t suggest a method that has brought great joy to our family over this past year. Our community service, or the ways by which we enrich the lives of others, has been the primary way by which we have coped, laughed, cried and enjoyed time over this past year. If you have not experienced this joy, or if it’s been some time since your last experience, you should find a way to serve. Contrary to opinion, we were made for fellowship. Fellowship with those inside and outside of the Church. All people, no matter race, religion, creed, economy or political view were designed to live in harmony. Our words and actions either build toward harmony or tear it apart. There’s no middle ground. Resolve this year to be a builder through service and be surprised by the joy of your attitude rather than depressed by the cynicism of your mind. If I tell you that Christmas is four days away, does that stress you out? Do you start thinking of all the things you still have to do? Are your lists getting longer and longer, instead of shorter and shorter? Do you think of all the things you wish you had done, but just didn’t have the time for this year? Two years ago, I would have answered ‘yes’ to all of these questions. Christmas has always been a favorite holiday of mine, but has also been very stressful. I tried to do everything, even before I had children. While I enjoyed Christmas Day, the days leading up to it felt like a big rush and the day after often left me feeling like I didn’t get done everything that I had planned. This year, I have found what I believe is a good balance between the two extremes. One thing that Kyleigh has taught us is just how important time is. We thought we had a lifetime with her, not just the nine months that she was in my womb. I am putting that into action with the holiday season, not only this Christmas, but hopefully every Christmas from now until I am reunited with Kyleigh. Marking things off my Christmas list before I even wrote them down this year was a good way to start. I got rid of the things that I was doing for myself…the things that I felt like I had to do to keep up with the Jones’, so to speak. Next, I simplified many of the holiday activities that we like to do as a family, but caused stress or took a lot of time planning or prepping. Making sugar cookies from scratch was not very family friendly, especially when all the boys want to do is decorate them and eat the icing! Buying premade dough is much easier and still allows us to have fun decorating. I am trying not to get stressed out or upset if something falls through the cracks. Oliver and I spent a few nights this week making bookmarks for his 20 classmates, but failed to make cards for his teachers. He was having fun and was excited to make something for his friends. I wasn’t going to rush him and make him upset just so he had time to make a handful of cards, too. The last thing we have changed as a family this year is sitting down each night to read our Advent book. It has helped to keep us all focused on the real reason for the season. We bought our Christmas tree off a corner lot vs. driving over 30 miles to the tree farm. I found a pre-assembled gingerbread house at the grocery store bakery that only requires the addition of red and green candies. 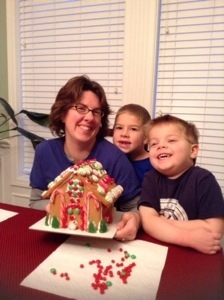 Spending all day baking and assembling a gingerbread house is not worth the tears it inspires when it falls to pieces. Instead of buying unnecessary gifts, we adopted a family and gave to others this season. We have enjoyed hearing the boys sing in their school Christmas programs, but have said ‘no’ to attending other holiday events. We have spent our evenings watching Christmas shows and driving around to look at Christmas lights instead of fighting the crowds at the local holiday attractions. My list of Christmas must-do’s has shrunk significantly. It may sound like we are still doing a lot, but I assure you, it does not feel like it. The important thing about this list of Christmas activities is that we are doing them together. We are taking the time to spend with each other. We have been able to slow down and enjoy the Christmas Season, not just the day. The quality time that we are spending together as a family is what my boys will remember about Christmas, not the hustle and bustle of getting things done. So for those of you who answered ‘yes’ to any of the beginning questions, I challenge you to take a look at your Christmas to-do list and start marking things off … permanently. If an oversized list is keeping you from enjoying time with those you love, or even from the Christmas season itself, it’s time to reevaluate. Keep the items that mean the most to you and your loved ones, especially the things that you do together. Get rid of the items that you are doing only for yourself or the ones that stress you out the most. I promise you will feel a sense of relief and a new found sense of Christmas joy! I am thankful that God uses Kyleigh to teach me the simple lessons in life ~ the importance of quality family time. I have been meaning to write this post for almost a month now, but if you read the title, The Holidays … Round 2, that is exactly why I haven’t done it. One thing that I have been told by others is that the second year of a loss is harder than the first. I always thought, “How is that possible?” Up until about a month ago, I didn’t believe it. I was doing pretty well. I hadn’t had what I call a bad day in quite a while. I made it through the transition from summer to fall, got through my birthday (which was hard last year) and even Halloween was easier this time around. Then the days of Thanksgiving came upon us all. Stores start to decorate for Christmas. Everyone talks about being thankful. Don’t get me wrong, I am very thankful for many, many things, it’s just an added reminder of so much that I have lost. And it all hit me so much harder than it did last year. I’ll be honest and say I had two really bad weeks. I hid it pretty well from most people. As the week of Thanksgiving approached, I started doing better. After we enjoyed turkey meals with both families, we took the boys out of town for the long weekend. I think getting away from it all, being removed from familiar surroundings and the welcome change in our everyday routine made all of us feel a little bit better. Since returning from our weekend away, I have held my own … mostly. It took me until just this week to feel in the spirit of decorating for Christmas and tackling the shopping list. I have to say though, that as I sit here tonight, our tree is decorated, lights are outside and my shopping is 99% done! I was in the Christmas spirit, I just didn’t feel like doing anything until now. My hope is that I can keep the momentum up for the next two weeks. The boys have Christmas programs coming up and just a few days left of school before winter break. Rodger returns tonight from his last business trip of the calendar year and then plans to take some much needed time off. Having him and the boys home always helps this momma! One thing that really struck me last year after the holidays, is that several people asked me how our Christmas was. And they didn’t necessarily ask in a compassionate way. When you know someone has lost a loved one, especially if it has been in the past year, do not ask them in your most jovial voice, “How was your Christmas? !” This really threw me off guard. It was not a question I was expecting and especially not from some of those who asked it. I understand that it is a common question to ask after the holidays, but take a minute and think about who you are talking to. Be mindful of what season of life that person is in and what is going on in their life. I finally had enough of being asked this, and similar questions, and told someone point blank how difficult Christmas had been and that we did what we needed to for our boys, but no, it was not a wonderful Christmas. I definitely shocked her with my answer, but maybe from now on she will say words such as, “I have been thinking about you and your loved one this holiday season. I’m sure it has been difficult to celebrate without him/her.” This leaves the person open to talk about how the holidays were or just to say a simple thank you. -Do what you feel like doing. -Don’t feel like you have to do anything. -If you commit to something and then just can’t follow through, back out of it … it’s okay. -Take your time in your grief and journey along your path at your pace. Jonah’s mommy, Maggie, has some wonderful advice for how to support someone who is grieving during the holidays: Grief and the Holidays. Many churches offer services of remembrance and hope during the holidays. This can be a time of reflection and even healing for those who are missing someone. Churches often have these services on or close to the Winter Solstice, the longest night of the year. I hope that something amongst all of this is helpful to you, whether you are grieving yourself or know someone who is. For those of you who have lost a child, I welcome any comments on how you get through the holidays. Does it get better? Is it always hard? What do you do to remember your child during the holidays? My point to all of this is that yes, the holidays are still hard. I know they will get easier … it has too. I just don’t know when. I am a little behind with my Seeds of Thankfulness posts. Ironically, being out of town over Thanksgiving is what got me behind! On November 25, 1993, Rodger and I stood outside in the cold night air, waiting to see the Christmas lights turn on at the Country Club Plaza in Kansas City. It was Thanksgiving night, and we had hitched a ride with my sister. Looking back on it, I’m a little surprised that my parents let me go. Rodger and I had both just turned 16, so maybe the catch was that we could go, but weren’t allowed to drive ourselves. Anyway, Rodger and I had met just a few months earlier when we were both 15, but he would not ask me out on a date until he had his driver’s license. I am a month older then him and he was not about to let me drive on our first date. At some point, we went to Perkin’s for dinner. I do not recall the date of this first dinner and if it was between his birthday in mid-November and Thanksgiving night, or after November 25th. All that I remember is November 25, 1993, is the date that my husband asked me to be his girlfriend. We have known each other for 20 years and have been a couple for nearly 19 of that. That seems a little crazy, but when you start dating at sixteen years old, it’s very possible at our age. Twenty years ago, we were sophomores in high school and had two classes together: Marching Band and Chemistry. We had been in classes together in previous years, but never paid much attention to each other. It happened to rain one morning, so we were inside for Marching Band practice. For whatever reason, we were all sitting around with nothing to do, so I walked up to Rodger and started talking. I think he was a bit shocked by it. Calling him to ask for help with Chemistry homework was my second move. Yes, I just admitted that I made the first moves. Despite the fact that I was not allowed to call boys, I was able to talk my mom into letting me call Rodger only for the purpose of homework. She knew what I was up to, I’m sure. From then on, we sat next to each other on the bus to and from band competitions and he was the reason that I passed Chemistry. At the beginning of our senior year, we did break-up. It made for a rough senior year, but on my birthday the following year, Rodger called me from a payphone. We agreed to speak to each other and work towards becoming friends. Five months later, he asked me once again to be his girlfriend, with the condition that we stay together and get married. 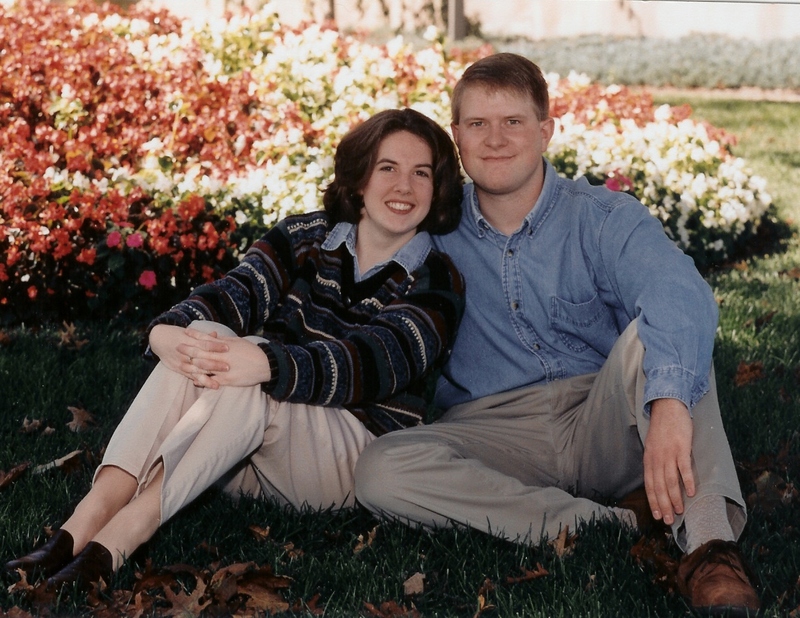 On November 6, 1997, we got engaged. After the longest engagement ever, we finally got married in June of 2000! I used to say that if it weren’t for us breaking up when we were 18 that we would have never gotten married. I don’t believe that anymore. Whether we had stayed together during that year, or spent that time apart, I believe that God placed us in each other’s lives for a reason and that reason is for us to be husband and wife. There are many circumstances that could have kept us away from each other and obstacles that we both had to overcome, but in the end, I truly believe we are meant to be together. I could sit here and type all night about our 20 years together. Instead, I’ll reminisce to myself. I will say that it seems like a lifetime ago that we met. I hope I get a lifetime with the one I love. I am thankful for my husband, Rodger. He loves God, loves me unconditionally and loves our children with all of his heart. Thank you, God, for giving me the man that You knew I needed!